Bollywood actor Ranveer Singh recently appeared for the Kapil Sharma show along with his gully boy co-star Alia bhatt. The actors reached the show to touch the small screen viewers for their new film’s promotion. This is Ranveer’s second appearance in the show former he made with Simmba co-star Sara Ali Khan. Padmavati actor considers Kapil as her brother said during one of her appearance in the comedy show. Host Kapil introduces the actors in the show with warmth, Alia got excited to become the part of it, while Ranveer was busy in a video chat with a caller sending virtual flying kisses to the unknown caller. Later this video gone viral at the social media in which Ranveer confessed Kapil that he is talking with his ‘ Bhabhi’. 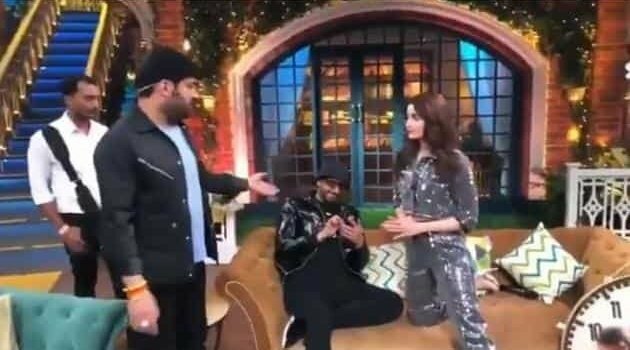 Singh can’t stop sending kisses to wife Deepika Padukone while on Kapil Sharma Show. Befitting reply by Neha Dhupia Over her Fatshaming Post pregnancy figure!! Young Brigade Of Star Kids Winning The Instagram With Their Hot Pictures!! !